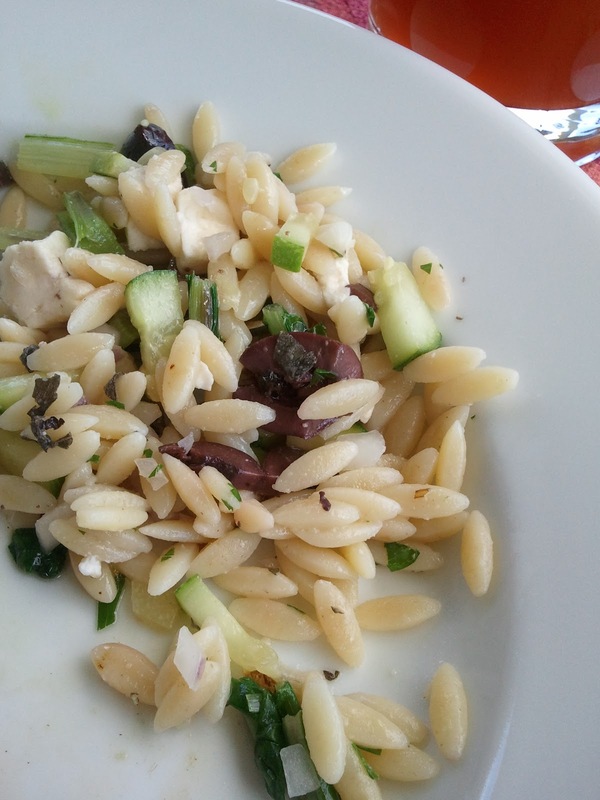 Orzo Salad | A Bushel of What? Yesterday was my birthday. I celebrated by hanging out with my two favorite boys (one little, one big) and doing nothing special, in particular. We ran some errands and picked up salmon to grill for dinner. We found a home for my new-to-me compost bin that is close enough to the back door for me to get to, even in the winter, but not so close that we can smell it doing its job. It was a stress-free, completely relaxed, productive day. It was a perfect way to begin a new year. Because our lives are run by a 2-year old whose time of day is decidedly NOT evening, we made an early dinner of grilled salmon, sauteed swiss chard in olive oil and garlic, and an orzo salad with fresh parsley and mint. While we made dinner, we sipped a Pimm's cocktail that I was recently served at a friend's house and had been meaning to make at home for weeks. For dessert, I was presented with a chocolate-mocha mousse cake and serenaded with "Happy Dirfday". We had a tough time explaining to our son that one slice of cake was plenty, and that more would make him sick. Then we fought with him over taking a bath, trimming his hair, brushing his teeth, and going to bed. Naturally. The following recipe is for the orzo salad that I made. It is fresh, light, and easy to make. I chose some parsley and mint from my garden, as well as a glorious little cucumber and a fresh red onion that we picked up this week from our CSA. I intend on eating the leftover salad later in the week, possibly with the addition of some cherry tomatoes and paired with grilled mustard-garlic chicken. In a medium saucepan over high heat, bring water and butter to a boil. 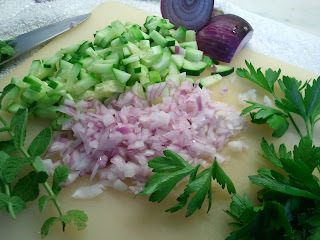 Add orzo and replace lid so that it is 1/2 closed. Stir to make sure the orzo hasn't stuck to the bottom and return pot to a boil, cooking orzo until al-dente, approx. 10 minutes. Remove from heat and drain water from pasta. In a medium bowl, add orzo and all remaining ingredients. Toss to combine. Season with freshly ground black pepper and let cool to room temperature, then serve. delicious. I've got to try it. My name is "ngi" from Tokyo. I'm impressed with the delicious dishes always clean. I look forward to the future. These recipes look very simple to follow & your photos are gorgeous. 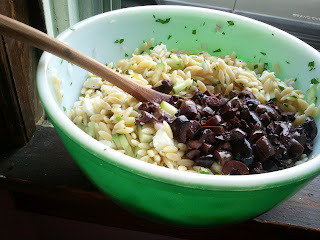 I think I will have to try this Orzo Salad Recipe myself. Thanks for sharing it! yummy salad I try to make it ! Looks great, and you could really adapt this to use anything that you have in your fridge! this is a great little recipe for a quick and healthy salad. Im always looking for great healthy recipes at this time of the year! glad I clicked to your blog, that looks amazing! This looks really really really really good. I don't make things with orzo nearly enough, so can't wait to give this a try. I guess it must be having a lot of nutrition goodies. Thanks for the recipe by the way. I bought orzo recently to say I have it, but haven't found anything appealing to do with it. This looks wonderful. I went two months once, determined not to make the same dish twice, which was why I bought the orzo. Completed the mission, but never used the orzo. Thanks!